Being the marketing director here at Practical Software Solutions is like being a utility infielder in baseball: You have to know a lot about many products, but you never really become an expert at one. That’s not to say that I wouldn’t mind being an expert in every software title we sell and implement. It’s just not feasible. Currently, we are certified in nine different Sage business software titles, ranging from manufacturing and distribution to construction and real estate to human resources. And that doesn’t count the add-on programs that we offer from Sage (like the Sage Construction Anywhere and Sage Inventory Advisor). Then there’s all the third-party programs that work with our Sage products (like LightWork Talent Management and PlanSwift). And don’t forget about our own modules we’ve developed, like Grower Vertical. When it comes to our sales, implementation, and development teams, they’re divided into segments so they have the opportunity to become experts for the software titles they work with. On the other hand, I am the marketing department, so I have my hands in all of those products. Granted, I could do my job with just a basic knowledge of our software. At the very least I have to convey to prospects and customers why Sage X3 or Sage 100 could help their business, and which industry segments would benefit from which product. I have to know enough to be able to point someone in the right direction if I’m asked for information. The problem is that I have a nasty curiosity streak. I want to learn everything. I’m fascinated about how things work, whether it’s computers or how a wire rack is made. I’m also fascinated with numbers and math. My non-stop curiosity wants to learn how our customers use our products. This past week, I had a chance to witness firsthand how one of our customers their software. Rhiannon Thompson from Davidson Excavating in Russiaville, Indiana, visited our office for training with the Estimating Basic module for Sage 100 Contractor. She told me this was something she could have done remotely, but training in person is more productive for her. She was also in (relatively) nearby Atlanta for more training at the Sage office, so it wasn’t out of her way to come by. 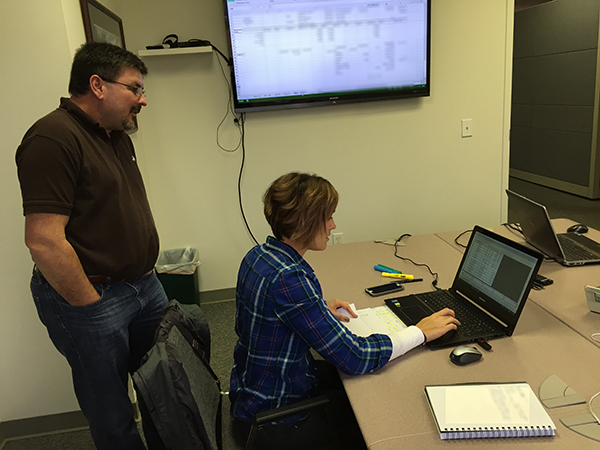 Tim Lambert, left, stands by as Rhiannon Thompson from Davidson Excavating works on Basic Estimating in Sage 100 Contractor. Usually, the closest I get to seeing how our software works is during webinars (like our user group meetings Tuesdays with Practical, Growing Together, and Coffee Break) or demos. But there’s a big difference between watching someone saying how a product works (which is all theoretical) and watching someone actually use the product. Rhiannon’s training wasn’t taking place in a demo environment. It was a full-on throw-her-into-the-deep-end-and-she-better-learn-how-to-swim-really-fast training session. She was learning Basic Estimating by taking one of her company’s recently submitted spreadsheet bids and recreating it in Sage 100 Contractor. Granted, since it had already been submitted, she wasn’t in danger of messing up the bid for the project. But it was still going to be a live bid in their system for their records. And since Rhiannon had never had a need to look over one of their bid spreadsheets before, this was still going to be a trial by fire. Rhiannon and Tim Lambert were still engrossed in the software when I poked my head in to see if they were ready for lunch. This was perfect! I sat down next to Rhiannon and watched as she was nearing the end of entering the data. Where she had never seen the spreadsheet before, I had never even seen Sage 100 Contractor outside of a few demos. You could tell Rhiannon was in learning mode, especially because she reminded me of how I learn a new program. She announced every move she made. “Ok, this is a labor step. Job code here, (number) here, (number) here …” She also said something that was so familiar to me, too: She was starting to memorize the job codes through rote. I said I could relate. When I was a Walmart cashier in college, I couldn’t help but memorize the produce codes on common items like apples and tomatoes. Even though she spoke a reassuring chant of steps, there was a rhythm to the way Rhiannon entered the data, as if she had been working with Estimating Basic for years. She had met her goal of learning by doing. And sure enough, I was learning the enormous amount of effort that goes into submitting a bid for a construction project. The only thing left was for her to get the final numbers in the software to match the spreadsheet. Now you may be thinking that this should have been a slam dunk. All she had to do was type exactly what was on the spreadsheet into the computer. But this is a lesson we try to teach everyone we come in contact with, no matter what industry they’re in: Integration is the key to reducing errors across your entire business. Why? Because we’re human. We make mistakes. We transpose numbers. We rush. We have other things on our minds. We skip lines. We accidentally click the wrong thing. The original data may have been wrong in the first place. The first time she totaled everything after finishing inputting data, she was way off from the totals on the spreadsheet. She and Tim pored over the numbers and found where there were little mistakes here and there. She was learning; of course she was going to make a few mistakes. But even this was an opportunity to learn how the software could help catch some mistakes. For now, close enough was good. She still had time in the afternoon to finish tidying up the bid and we were hungry. Before we got on the road, she was on the phone to Tami Davidson, her mom and the owner of their company. She had good news to report: Even though she was recreating a bid, she could see how this was going to help them immensely in time saved and errors reduced. A few months ago, someone asked me how we get so many customers to join us at Sage Summit. There’s no magic formula. We genuinely care about our customers and have a great relationship with as many as possible. Being genuine is the secret ingredient. People can spot a phony from a mile away. They would know if we were trying to buy their loyalty. I’ve seen executives at our company be as generous with strangers, friends, and employees as they are with our customers. We sell, implement, and develop software, but more importantly, we help people and businesses. If we feel that we won’t be able to help a business with our software or services, then we will politely decline. Believe me — it has happened on more than one occasion. 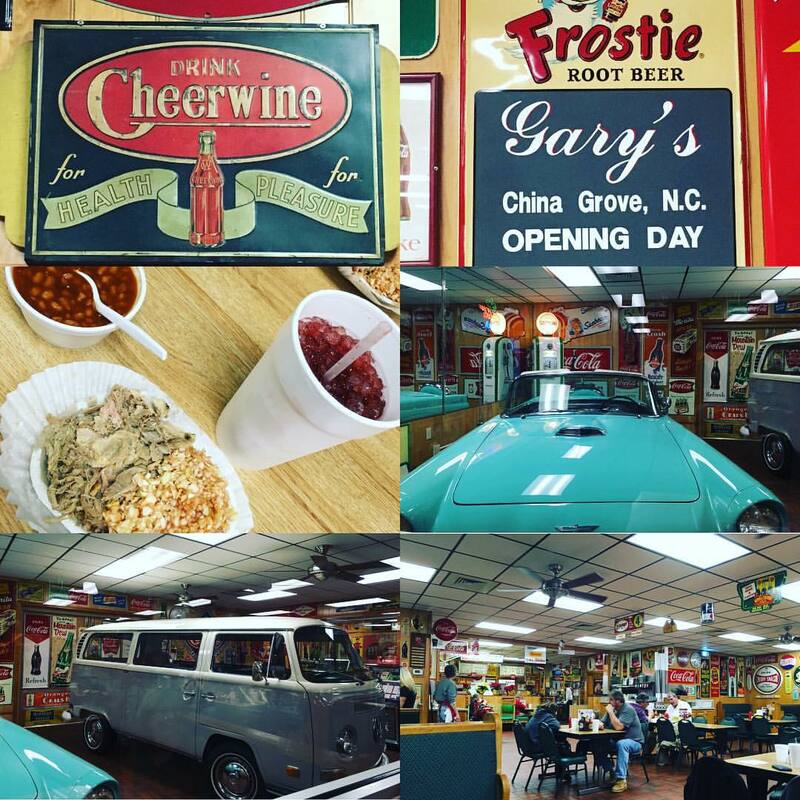 Rhiannon enjoyed Gary’s Barbecue so much that she posted her experience on Instagram. There are some things you learn from a training session, and other things you can’t learn out of a book or from a teacher. As we sat in Gary’s BBQ eating lunch, we started learning more about each other. It turns out we both enjoy finding hole-in-the-wall restaurants while on trips, so my suggestion of Piedmont North Carolina style barbecue was right up her alley. (She also had her first taste of Cheerwine, which was awesome!) We also talked about work, family, food, and smiled when the waitresses stopped to join in our conversation. This is my job in a nutshell. When I can learn about our customers on a personal level, I can learn what the next person down the line may deal with on a day to day business. Then I can connect with that person and help point them in the right direction, and maybe learn from them one day.